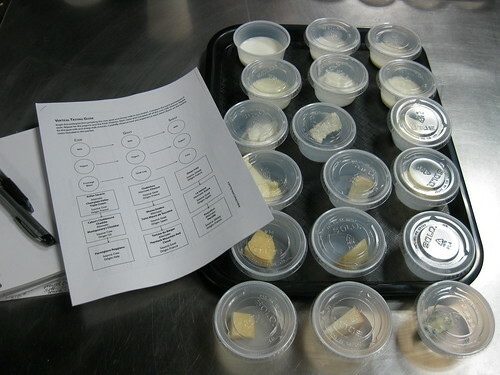 The last week of Level 2 did include some of my favorite lessons, one of which was cheese and rice day. I’m not really sure how and why cheese and rice came to be put together in the curriculum. 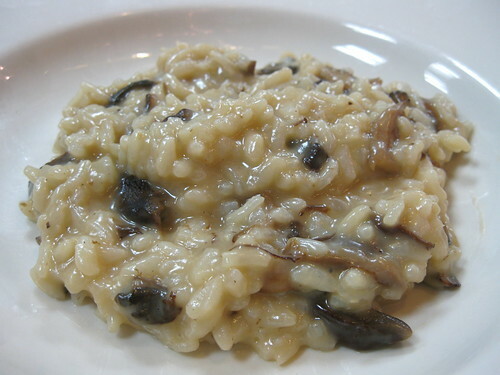 They do come together in risotto, but other than that it seems like they were just thrown together because there was nowhere else to place them. Nonetheless, it was a delicious day. Cheese took up the majority of the day. I LOVE cheese, so this was a very exciting for me. The majority if the morning was taken up by experiments in cheese making. 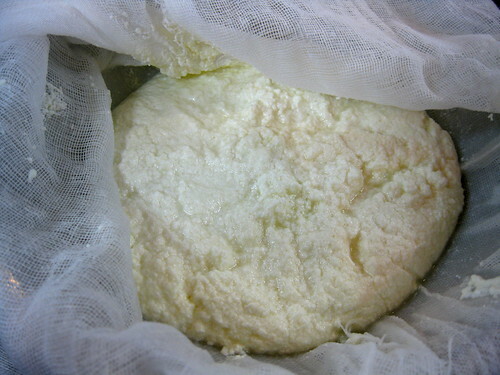 We got to make our own ricotta. Friends had told me that it is actually very easy to make and it had been on my to-do project list for ages. The truth is that it is really couldn't be easier. It is also a little gross, because basically you’re deliberately curdling milk. 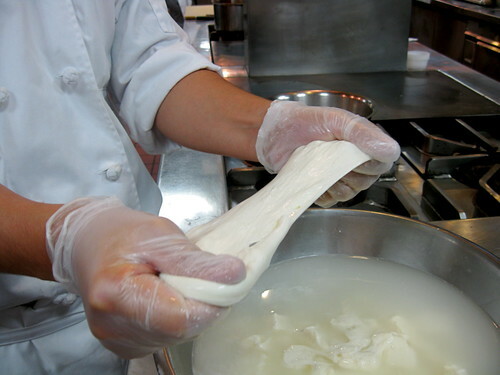 I found it perversely entertaining to watch the curds form. 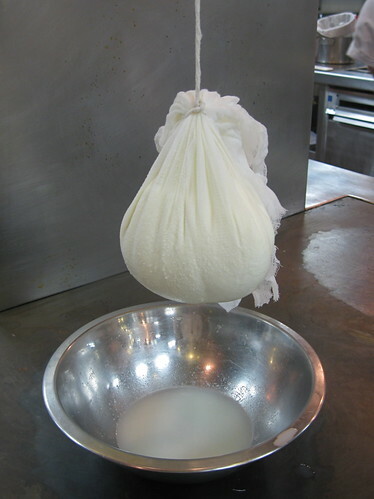 Once you’ve got those curds where you want them, you try to expel as much liquid as you can by straining the curds over cheesecloth, tying that up, and hanging your bundle to drain a while. 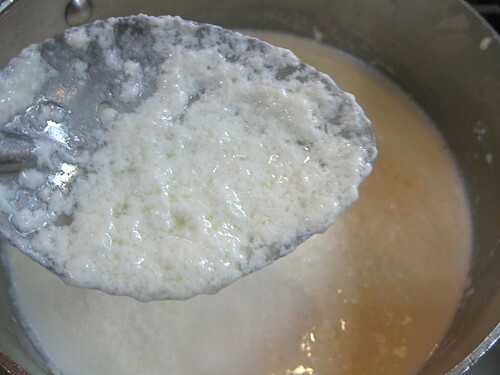 The result is delicious ricotta. It’s a fun little experiment to try. There are several ingredients you can use to get the milk to curdle such as lemon, vinegar, citric acid, rennet, or buttermilk. 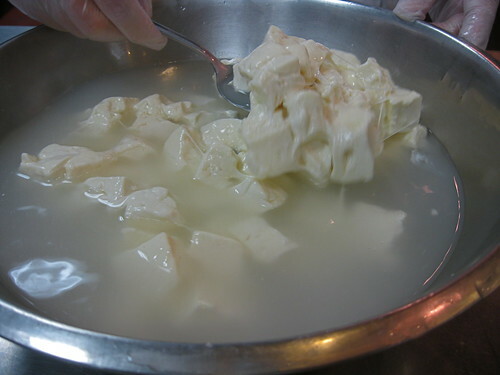 Tip from Chef: If you’re going to try this at home, use the least processed milk you have access to, as less processed milk will yield better curds. 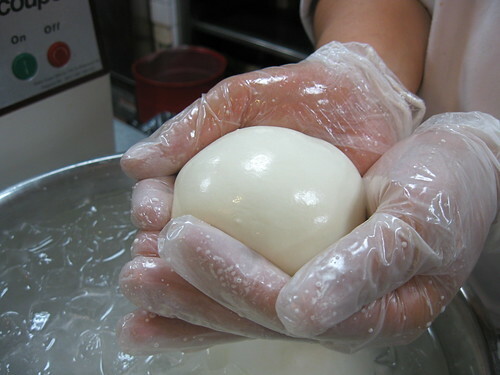 We also got to mold our mozzarella, which was basically like playing with wet silly putty. The afternoon was dedicated to tasting cheeses. Each student received a tray of 18 filled plastic cups. Three held milk—cow, goat and sheep. The next three had yogurts made from those milks, followed by 12 cheeses in various categories from the three types of milk. It was a very interesting tasting. I don’t believe I’d ever tasted sheep’s milk before. 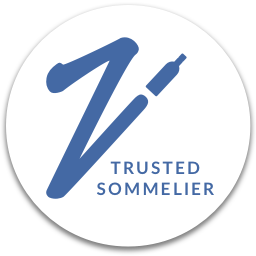 It is very rich and little to creamy to make you want to our it in your cereal or pour a tall glass to drink with a cookie, but I can definitely see how these characteristics would be ideal in a cheese. The goat’s milk was bright white and tasted grassy like pasture the goats might have grazed on—exactly the types of flavors you’d find in a soft goat cheese. Cow’s milk was just good old fashioned milk. Trying the milks and yogurts side by side definitely demonstrated how each one could provide a different canvas from which to create a cheese. From there it was all about the cheeses and we got to try so many different types—creamy, hard, fresh, washed-rind, and blue. HEAVEN! Cabot Clothbound Cheddar: Crumbly, cow’s milk cheese with toasted, nutty flavor and a nice sharp bite. Monte Enerbro: A soft goat cheese with earthy mushroom flavors and a bit of a tang at the end. Roquefort d’Argental: a beautiful, creamy, sheep's milk blue with a spicy bite. One of the world's best blue cheeses according to many sources. 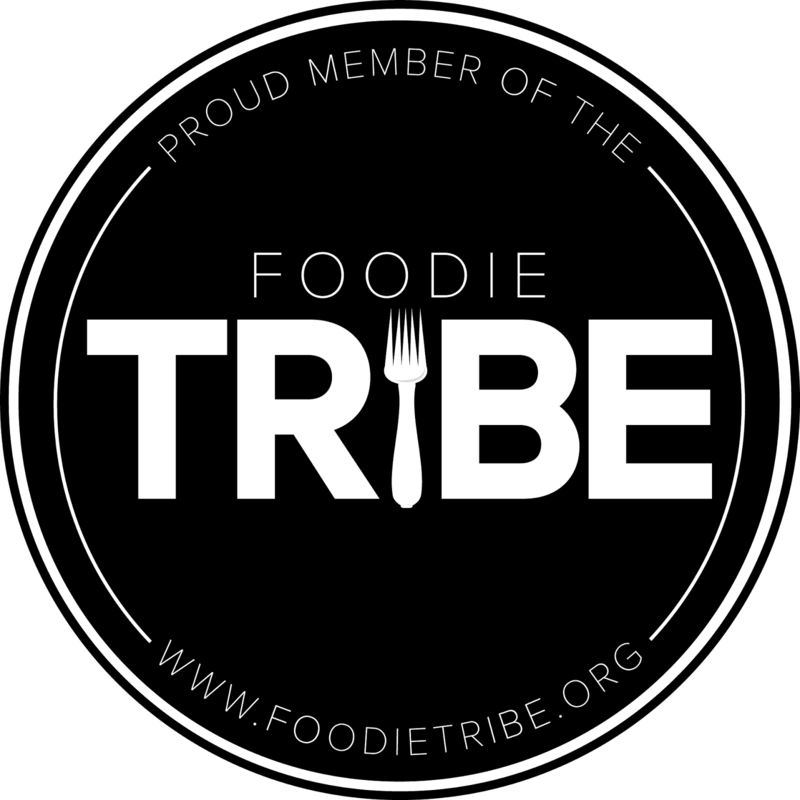 If any of my L.A. readers are interested in learning to make cheeses or risotto, you might want to check out Hipcooks. They hold fun, low-stress cooking classes and I know they have classes on both cheese and risotto.